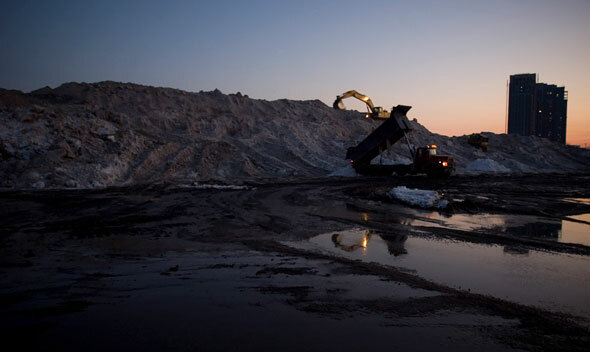 It might be hard to believe, but slowly, ever so slowly, the city is removing the snow. I never really thought about where it all goes until I was driving around the west end yesterday and stumbled upon a mountain, a literal mountain - eight-stories high and at least the size of 5 football fields - of snow. A supervisor at the site (South East corner of Kipling Ave and Bloor St) told me the site has been adding about 60 truck-loads of snow each hour, 24-hours a day, 7-days a week for the past couple weeks. Photo slideshow after the break. I couldn't get over the childhood excitement of seeing all the trucks and bulldozers and big-scoop thingys that pick stuff up... I forget what they are called. It did cross my mind however that the neighbors can't be too happy, and what the hell is going to happen when all the snow starts to melt? It's really something to check out though, if you're a fan of the snow or if you absolutely hate it. I'm thinking it could soon surpass the size of Centennial Hill if we have just one more small snow. Not big enough, or not working on your browser? Check out the fullscreen slideshow on Flickr.